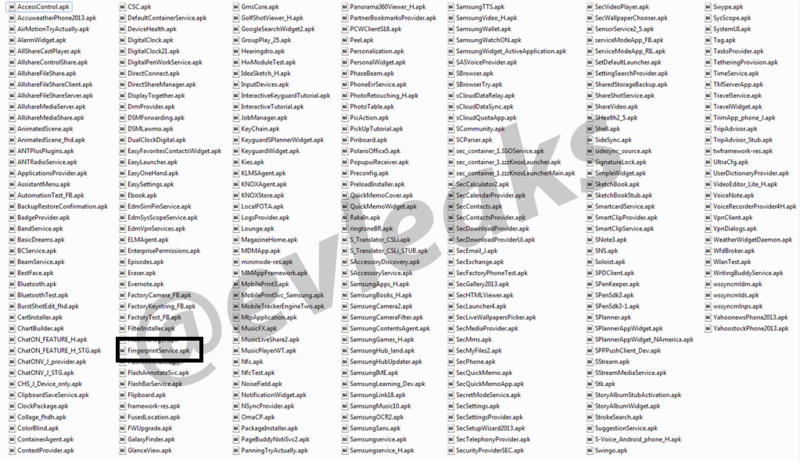 Evleaks has outed yet another detail from the software of the Galaxy Note 3, this time posting the entire list of 276 APKs that reside on the system partition of the device, providing all those features we’ve come to expect from TouchWiz. However, one particularly interesting APK file caught my eye, and that’s the FingerprintService.apk file, which once again hints that Samsung is planning to introduce fingerprint detection on its devices. We had first seen hints of fingerprint detection being used on Samsung phones through a series of images found on the Galaxy S3’s test 4.2.2 ROM, though there was no APK conspicuously graced with the fingerprint in its title back then. With that changing on the Note 3, it’s entirely possible that the device will debut with fingerprint technology, or at least take Samsung one step closer to implementing the technology on its next flagship, which will most likely be the sequel to the Galaxy S4. Don’t worry. the fingerprint service i see it neessary only if you work in CIA, pentagon, or the USA White House. The lag is most important: WTF ammount of apps!!! All them are working at the same time on TW?